Todd Akin Loses to Claire McCaskill and defines the crazy line. 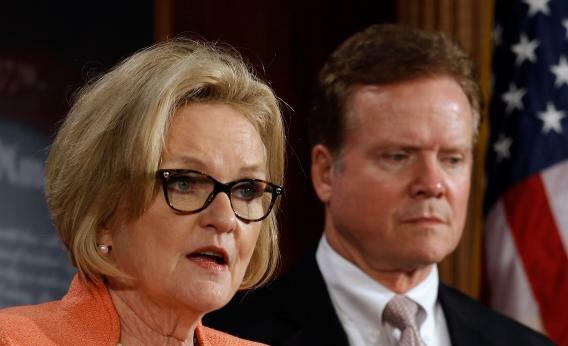 Sen. Claire McCaskill and Sen. Jim Webb announce legislation to overhaul the federal government’s planning, management, and oversight of wartime-support contracting at the U.S. Capitol March 1, 2012 in Washington, D.C. Nonetheless the voters of Missouri did the right thing, and re-elected McCaskill, and for that we are grateful. Younger, pro-choice, and African-American women came out more strongly to vote for McCaskill than they did in 2006, and gave her a solid lead. The bonus here is that if things stay on track, we are on the way to having a record number of women in the U.S. Senate. The lasting legacy of Akin and Indiana Republican Rick Mourdock, who also lost his race, is that together they seem to have outlined in bright pink where the crazy line is. It is clear now that you can not say certain wacko things that you read about in a church bulletin or overheard a “professor” lecture on in in a bible study group and expect the support of either your own party or the voters of your state. You can particularly not do these things in mansplaining mode because women, who make up the majority of voters in many states, will make you pay. The downside of course is now the fringe has gotten a loud reminder that they must not air their fringe in public anymore, that they must keep those church bulletins tucked safely in the inner pocket of their khakis if they want to be elected, that they must, in order to survive, do the thing they hate the most: evolve.